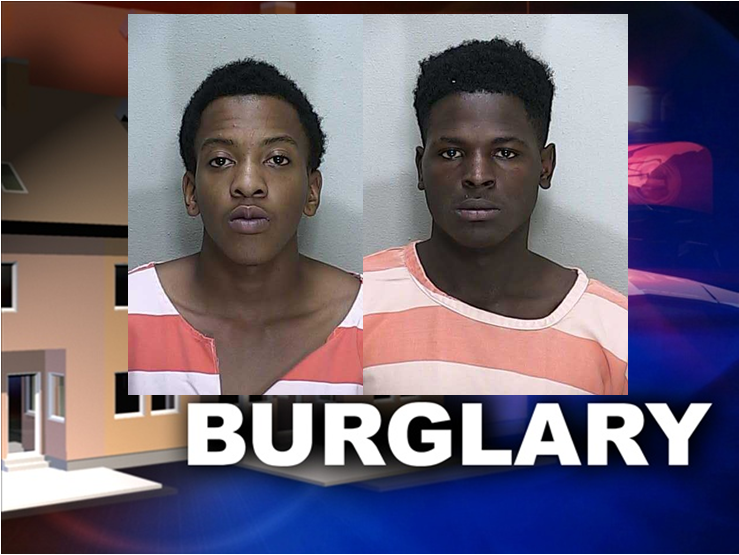 Summerfield, Florida — The Marion County Sheriff’s Office has arrested two teens for a string of burglaries throughout Marion County. On Friday, Marion County Sheriff’s Office deputies responded to the BP Gas Station located at 9945 Southeast Highway 42, Summerfield, in reference to two suspects who were breaking into the store. According to reports, the would-be thieves smashed in the glass front doors of the business. An alert citizen was able to provide deputies with a description of the suspects and their vehicle. The MCSO said that responding patrol deputies located the vehicle at the VA parking lot located in the 8800 block of SE Highway 42, which is not far from the incident location. The vehicle was occupied by two black males, later identified as Berisford ‘BJ” Champagnie, 18, and Rushawn Kevon Simms, also 18. During the investigation, detectives were able to link the teens to eight commercial burglaries. Detectives executed a search warrant on the suspects’ vehicle and found stolen items that were taken during the burglaries. According to reports, during one of the burglaries, the suspects stole a cash register that contained approximately $2,500 in cash. It was recovered from inside the vehicle during the search. Additionally, other currency and an assortment of lotto tickets from other burglaries were found inside the car. Champagnie and Simms were each charged with five counts of Grand Theft, one count of Criminal Mischief, and eight counts of Burglary. They are being held on a $100,000 bond each. The investigation is on-going and additional charges could be possible.